��Magnet School� is a group of articles devoted to the intimate study and increased awareness of obscure and unusual games, presented in a compact, structured format. To read the full, formal introduction to this series please click here. Heads up, everyone. Today, make sure to hit the locker room before we begin � this class is different from all the rest. At this point in your education it�s high time you got your hands dirty � no, not literally, controller upkeep is something we believe in very strongly here at �Magnet School. What I mean is, in every game we�ve covered so far you�ve only participated in distant, abstract ways: so tell me, how do you feel about actually getting in on the action personally, being a part of the puzzle, solving it from the inside instead of merely observing from afar? Well, for the next three lessons that�s exactly what you�ll be doing: I hope your thumbs are in good shape, because these games will give them their most intense workout yet! What Is It? 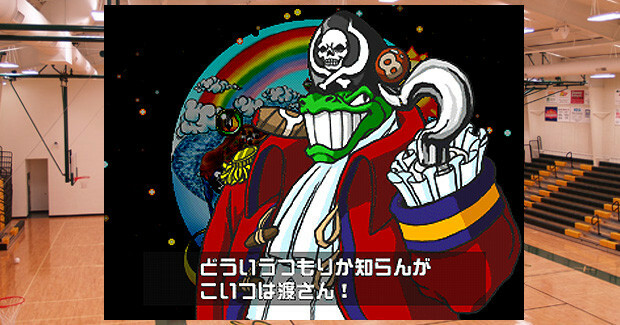 � If you encounter the phrase �puzzle shooter� and your response is something other than �huh?�, you�re probably thinking of ADK�s Twinkle Star Sprites, which has become something of a cult hit over the years. Fun as it is, TSS is definitely more �shooter� than �puzzle� � for something more in keeping with our theme you ought to seek out this 1997 release from Clef, another low-output developer which has all but totally vanished into the ether. Perhaps the company�s most memorable single feature is their perplexing slogan: �For Comfortable Human Life�. A rather grandiose aspiration for video games, don�t you think? Dare to dream, I guess! How Does It Work? � As in many other puzzlers you�re given an enclosed area to work with, but in Calcolo you don�t just own the property, you live there too: each player directly moves a flying character around his or her field, in similar fashion to an overhead shooter. All the while orbs, each bearing a number from �2� to �9�, slowly fall from random spots above you; at first they show up pretty gradually, but before long several will be arriving at once (thankfully, you can see them coming a bit before they actually enter the well). Groups of two �2s�, three �3s�, four �4s� and so on will vanish when they�ve reached the ground (bunches that are one away from a full set will flash, to make picking them out easier), and chaining is also possible; putting everything into place, however, is a far cry from what you�re used to. Remember, this game is part shooter � pressing any of the 4 face buttons on the Playstation controller causes your character to release a shot in the corresponding direction (square for �left�, circle for �right�, X for �down� and triangle for �up�), and you can even aim for multiple targets at once by pushing two or more of the �shot� buttons simultaneously. Hitting pieces from either side will nudge them over, while a bullet from above will fling them straight down � even more interestingly, blasting a ball (hopefully one you don�t need) several times from below will destroy it completely. On a basic level, that�s all you need to know � once you get used to the novelty of herding orbs around via your character�s shots, things will start feeling much more familiar. Of course, you didn�t think we�d be stopping at �basic level�, did you? Calcolo�s innovations, after all, go far beyond how you move stuff around � for starters, while an opponent�s chains dump garbage on you as per usual, if you�re quick you can shoot these unwelcome guests right out of the air, before they hit bottom and become �permanent�. Pick your targets carefully, because if incoming junk hits a falling �normal� piece on the way down the latter will be dragged to the floor, likely in a spot you didn�t want it. Calcolo also makes use of the �power meter� gimmick you�ve seen a few times already � both matching and shooting pieces off your field will fill it up (larger numbers and chains do so faster), and a subsequent press of the �R� trigger will clear part of your area, reverse your rival�s controls, or offer other advantages, depending on your chosen character and how many energy stocks (up to 3) you�ve stored away. Also be sure to make good use of the occasional floating power-ups which appear after chains are made: these can increase your speed, strength, or shot spread when collected. Finally, keep an eye out for rare �1� and �0� bonus balls: the former will instantly clear away any individual pieces it touches, while the latter will banish all of whatever numbers it lands on from the screen. Why Should I Play It? � At first, you might think that Calcolo is only noteworthy for its unique control interface, which takes some practice to master - this is certainly part of the game�s appeal, but these �shmup� elements add much more to the standard ochige formula than that. The ability to simply shoot away both enemy garbage and unwanted numbers, for instance, is certainly nice, but overusing the latter can put you at a disadvantage, since waiting too long for an ideal sequence to show up leaves the opponent free to scheme (and mess you up) without fear of retaliation. 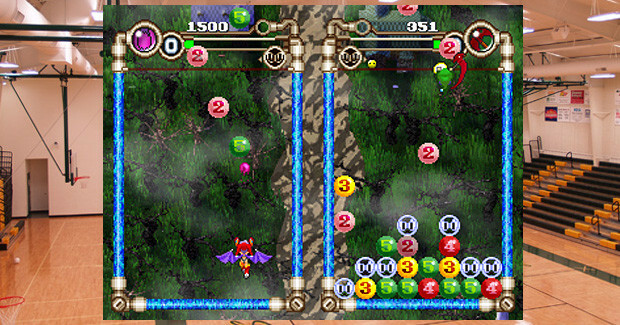 Having to juggle multiple pieces in midair at once also forces players to both plan AND prioritize � sometimes it�s almost impossible to put everything exactly where you want it (especially if you�re under attack), so cutting one�s losses and keeping a calm focus are absolutely crucial skills. 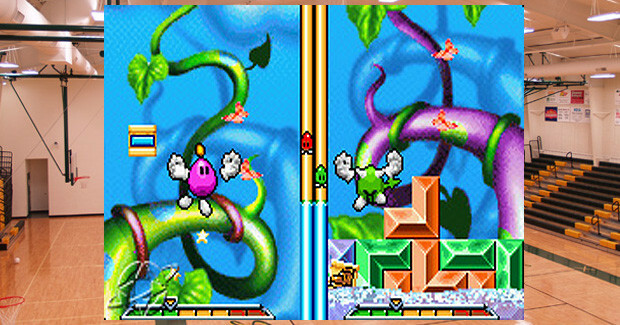 Moreover, if battling the CPU or a pal (up to seven of them, in �Tournament� mode) in the standard game isn�t your style, there are plenty of other attractions on offer, from Time Attack to Survival to an unusual �Gauntlet�, which lines up a series of challenges (make x amount of chains, survive a constant hail of garbage for x amount of time, etc.) to complete in succession. Visuals are, frankly, a bit subpar, though the sounds (and character voices in particular) are rather well done � speaking of characters, even by puzzle game standards there are some pretty weird ones in here, from a snowboarding penguin to a tank-bound terrier to a crocodilian pirate reminiscent of K. Rool from Donkey King Country. If it�s an eclectic cast you�re after, this particular octet ought to have you wondering what kind of fever dream the developers must have endured to put them all down on paper. Where Can I Find It? � You probably already guessed this when I specifically mentioned the Playstation controller above, but Calcolo was only ever released for the PS1, and only in Japan � yup, it�s Import Time again. The game isn�t a common sight in the wild, but since it�s so obscure and unorthodox few collectors are fighting over it; thus, cost shouldn�t be much of an issue once it does show up. Anything Else? � Off the cuff, at least, not too many puzzlers integrate shmup elements the way Calcolo does � the aforementioned Twinkle Star Sprites (as well as its lesser-known PS2 sequel, La Petite Princesse) is probably the game�s closest cousin, for whatever it�s worth. That said, there ARE a few other �puzzle shooters� out there, but I�ll refrain from referencing those for now�why would I do that? Maybe if you keep up with your lessons you�ll eventually find out. What Is It? � A palpable tension has permeated this classroom�s air for a while now�murmuring reached my ears not long after �Magnet School first commenced, and hasn�t let up since. �Dammit, BM�, a bunch of you are grumbling � �How can a puzzle-centric series go on so long with hardly a fleeting mention of Tetris?� O ye of little faith, allow me to introduce our next subject, a relatively recent release from 2002 - its developer, Hotgen, is another name most frequently associated with licensed fare, but trust me, this one is different, and more than worth your attention. Ladies and gentlemen, the timeless Tetris legacy has finally come home to �Magnet School. How Does It Work? � The basic concept behind Tetris is to build solid, unbroken horizontal rows using various angular blocks. Your goal here is the same, but the reward for your efforts couldn�t be more different: successfully completed lines in Egg Mania do NOT disappear, and moreover you don�t WANT them to. Why not? Note the constantly-rising swell of water approaching from below: the only way to avoid it is to build a structurally-sound tower high enough to reach a waiting escape balloon, and if the encroaching flood reaches a gap-ridden row it will instantly crumble away. You�ve got to be careful even if you�re a ways ahead of the tide � at the bottom of your screen is an �integrity� meter, and the higher you go without making sure everything is filled in, the farther into the �Danger� zone it moves. Press your edifice too much, and all of your shoddy handiwork is reduced to dust in one fell swoop. 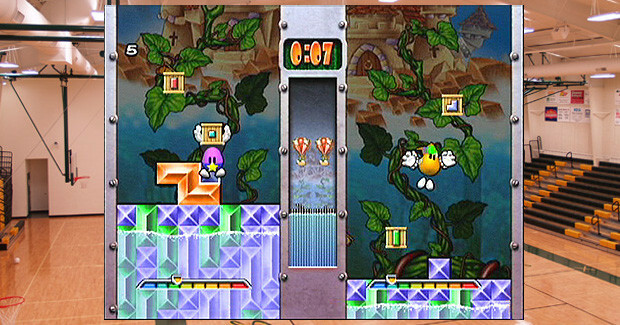 By the way, you�ll often have a rival busily constructing his own skyscraper across the screen, and only the competitor to reach the top first gets away dry. Of course, there�s one other major detail to keep in mind: this is a �Phys. Ed� game, and as such you�re not in control of the building materials, but of the builder, a cartoon egg-person (hence the game�s title) actually running and jumping around in the middle of the action. Your blocks fall from above, but if you just let them go they�re of no use to you at all � the idea is to actively catch a piece you want, rotate it into the desired orientation, and then slam it down in a suitable place before hurrying to snag the next one. Tetris-style pieces aren�t the only things that will float your way, either: along with occasional power-ups such as high-jump shoes or cement (which will fill in small gaps of any shape), you�ll also obtain weapons like bombs or hammers, which can be thrown across the screen to either damage your opponent�s tower or temporarily knock him off his perch (watch out, as bombs can be volleyed back and forth until they blow up). If you accidentally grab something you don�t want it can be easily discarded with no penalty, but be extra careful on certain stages where indigenous enemies will harass you, either by stealing your stuff or attacking you directly � either way they can cost you precious building time. 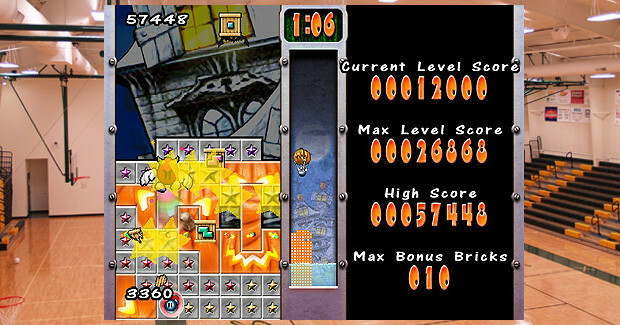 You might think that Alexey Pajitnov is currently on his way to Hotgen�s HQ to bludgeon them with a pipe wrench, but once you read about Egg Mania�s scoring system you�ll realize that this game is truer to the spirit of Tetris than it seems at first. While putting together individual rows in Tetris isn�t overly difficult, that�s not the point � to excel at the game you�ve got to delay clearing out screen space long enough to nail several lines at once, ideally a set of four via a straight piece (i.e., a �Tetris�). Taking on risk presents a similar opportunity for reward in Egg Mania � complete more than one row with a single block and star-studded �bonus bricks� (and some extra points) will appear to add a little more height to your tower (and your ego). And that�s not all � even if you build over an empty space, your little egg dude has the handy ability to jump down to a lower �floor� and directly deposit a piece into the offending spot. If you�re daring, you can purposely leave strategically-placed open spots as you ascend � your foundation will shudder, but if you manage to sneak in a well-placed �filler� block (especially a large one) before disaster strikes you�ll be swimming in bonus bricks, more than making up for any lost time. 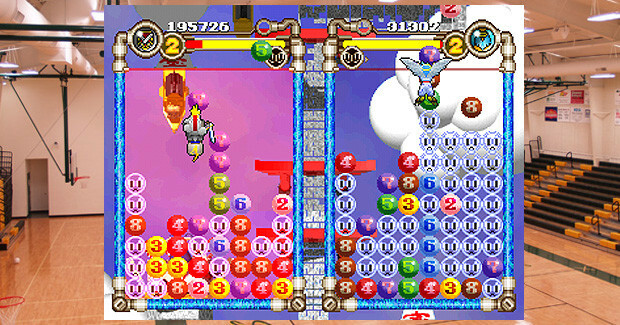 Egg Mania also serves up a smorgasbord of variations on its central theme: if you don�t feel like the standard �Versus� game (which can get very tough against the computer once you�re a little ways in), you can try a score-centric �Solo� mode, endless �Survival�, �Bomb Mode� (you and your rival start off with completed towers; the goal is reducing the opposition to rubble with a bevy of weapons), a multi-player Tournament, or even a �Custom� mode, where you can adjust individual rules and other elements entirely to your liking. While the game�s graphics are nothing too impressive quality-wise (and inter-match load times are a bit excessive), the designers took welcome care to keep things interesting: each level boasts a different setting (Prehistoric, Medieval, Mayan, Halloween, Futuristic, etc. ), and not only the backgrounds, music, and enemies but the blocks themselves have been �remixed� for each one. In this way, both the challenges of tower-building and the places you visit along the way are unlikely to bore you for a good long while. Where Can I Find It? � Finally, a �Magnet School puzzler that�s relatively easy to find and play! All three regions got it on several home systems (in PAL territories it goes by the name Eggo Mania), and if you see a copy it�ll probably run pretty cheap, so there�s little reason not to give this game a go. The best-known iteration, subtitled Eggstreme Madness (*double groan* �on second thought, Alexey, I might need to borrow that wrench), appeared on the PS2, Gamecube, and XBox: I�m not aware of any major differences between them, so pick it up for whichever console you prefer, since it�s the most full-featured edition. At around the same time a GBA version (start that video around 3 minutes in, and ignore the commentary as best you can) hit shelves as well � obviously it�s lacking some accoutrements from the larger-scale iterations, but it�s not too bad if you�re on the go. Anything Else? � Nobody else that I can think of has ever pulled a genre-mixing stunt quite like Egg Mania�s, but if you don�t mind block-building with a dose of Lemmings-style action instead, Tetris Plus, its sequel, or one of the Gussun Oyoyo titles might be a good fit for you (recent PC/XBLA release Lucidity runs in a similar vein, but reviews for it were somewhat poor). In terms of a more traditional ochige, Tetris Gaiden Rensa is pretty well-regarded: as in Puzzle Arena Toshinden, you and your opponent fight over a single sequence of pieces, especially those with glowing parts, which award power for spells when cleared (the ability of �leftover� bits to drop down and chain after a line clears is handy too). Finally, I�ll mention the upcoming Slam Bolt Scrappers again, obviously due to its emphasis on reinforcing your own tower while bringing down your opponent�s. What Is It? � This 1998 release comes to you courtesy of Micro Cabin, a developer whose work has been around forever, but seldom sees daylight outside of Japan. The name �Kouji Oono� is prominently associated with this game, though it doesn�t ring much of a bell with me offhand - this page suggests that he�s spent at least some time with Nintendo, but then again it could be a totally different guy. Anyway, one quick note before moving on: despite being spelled with all capital letters, NOON is not an acronym, and is pronounced the same way as in English. How Does It Work? � At a glance, NOON could be mistaken for some unreleased prototype Zelda �versus� hybrid. A 9-by-9 �top-down� grid comprises the playfield: both player and enemy characters can walk freely around it. A glowing 2-by-5 group of tiles is set at each end of the field to serve as each competitor�s �vital zone� � if someone�s zone is completely covered with objects during a battle, a 10-second countdown will begin, and once it reaches zero that player loses (the limit doesn�t �recover�, either, so if you clean your zone out with 5 seconds left, the countdown will start right from there next time). What exactly are these �objects� I refer to? 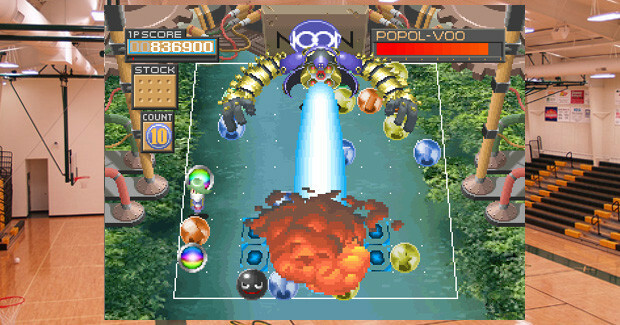 Once a match begins, various colored orbs start to gradually appear in random spots around the field � these can be pushed (but not pulled) by the players in any direction. Competitors also have access to a short-range attack, which can be used to knock opponents away or fling balls across the board (these have the handy ability to stun rivals who �happen� to be in the way). If you want to make navigating around everything a little easier, don�t forget that you have use of a �pivot� button, which allows your character to turn on the spot. 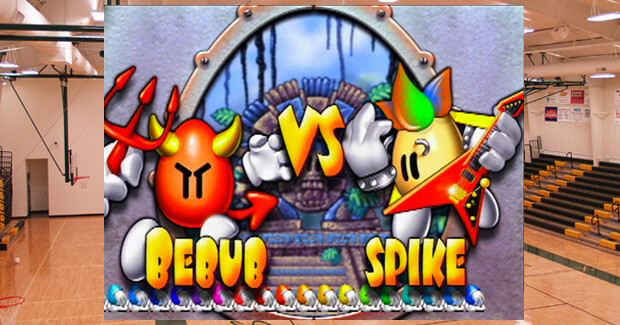 You might assume that just pushing stuff into the opponent�s zone quicker than he can do the same to yours is the way to win, but you�d be wrong � aside from simply shoving everything right back out, either player can also push a ball into a wall or any other obstacle to �squash� it and remove it from the playfield entirely, making defense relatively easy�until you learn how attacking really works. 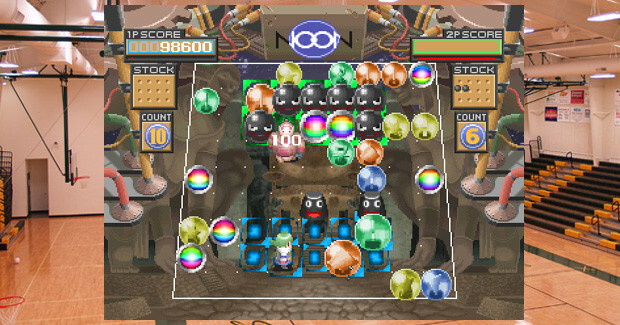 If you can arrange 3 or more like-colored balls into a straight line (you can also use �rainbow� balls as wild cards, and even as �links� between different-colored lines), then �set them off� with an attack to one end of the formation, all of them will burst and you�ll score a �NOON� � doing so causes garbage pieces to instantly appear in the enemy�s zone. And that�s not all: �squashing� balls will add fuel to a special attack meter, which can be spent to clean out your zone, fill the opponent�s up, or various other things, depending on the acting character. Finally, a handful of instant-activation items will occasionally appear amidst the spheres � these can stun or shrink the enemy, max out your meter, or even switch your playfields around if collected. Got all that? Matches against �normal� opponents are best two out of three�until you hit a boss, that is. Why Should I Play It? � Don�t be misled by NOON�s self-applied label of �New-Type Action Game� � if you try to play it like a reactionary twitchy-finger title, you won�t get far. Success here is reliant, above all else, on precision: while the goings-on may seem chaotic at first, any player who knows what he�s doing moves and acts only with purpose. You might be on your way to putting a NOON together, but is your opponent even closer to one than you are? If so, perhaps you ought to drop what you�re doing and go harass him a little (and steal that NOON from him while you�re at it!). What if the enemy is the one pestering you? Lure him into a tight spot and stun him with a ball, then mess up his zone to force a retreat before he recovers! Your field�s looking kind of full, so pulling back and building up some power meter might be a good idea - as long as your rival�s not about to unload on you and render your defensive efforts null and void. You�ll constantly be keeping a close eye on the entire battlefield and re-assessing what your best option is for the current situation; if the other side is doing its job, you won�t be able to stay too comfortable in one place, or with one strategy, for long. 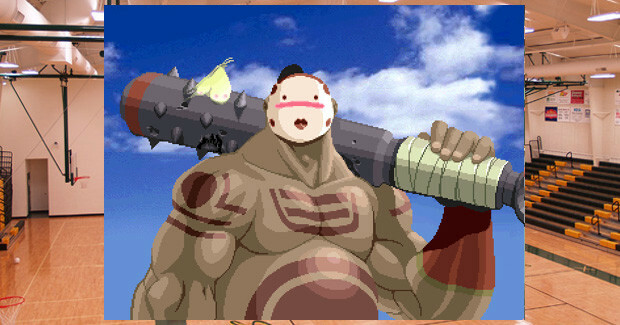 On the downside, NOON can sometimes feel a bit too random to be completely fair � while the main �orb� pieces are generally manageable no matter where they show up, once items are a part of the equation a lucky grab at an inopportune time by the enemy can royally screw you over, and items can�t be turned off (though knocking an opponent into one will destroy it). This flaw isn�t enough to offset the title�s more appealing traits, thankfully � the �best 2 of 3� structure, in particular, helps to dampen the impact of such unfortunate twists of fate. When you need a break from battling the computer, up to four human players can duke it out simultaneously via multi-tap, or you can relax solo and try to quickly rack up as many points as you can in �Score Attack� mode. Eye-catching visuals tack on another point in the game�s favor: while most of the characters (who vary in speed and attack styles as well as special techniques) look to hail from a �swords and sorcery� fantasy, they�re surrounded by a futuristic, pseudo-steampunk world, complete with neon lights, building-sized gears, and rumbling, clattering tank artillery. I�m not sure exactly what the plot is, but it�s a pretty cool set of props, regardless. In case that wasn�t enough to perk you up, then there�s the raspy, roaring rock soundtrack (the likes of which you almost NEVER hear in a puzzler), which serves as the cherry on top of NOON�s intriguing, and slightly intimidating, strangeness. Where Can I Find It? � According to this page on the Micro Cabin site, NOON was released (in Japan only, natch) for the Saturn, Playstation, and Windows �95. Most people, obviously, will want to go for one of the former two, whose rarity and value are generally higher than that of your average under-the-radar puzzler, but still well within the budget of most import gamers. If you can finagle a way to try before you buy, I recommend doing so to determine this oddball game�s �I�d buy it for that much� price for yourself. Anything Else? � The best-known cousins to NOON are the various Bomberman games, along with more obscure �overhead versus action-puzzler� variations like Exvania. 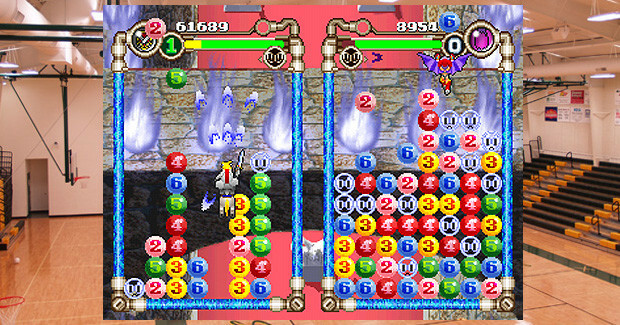 Moss's Flip Maze is also similar in spirit, though here you don�t attack your opponent directly � instead, by arranging the tiles on your side into sets (and sets into combos) you create garbage which can push your opponent off the edge of his playfield (doujin offering Otoshimasu offers a �remix� of these elements). 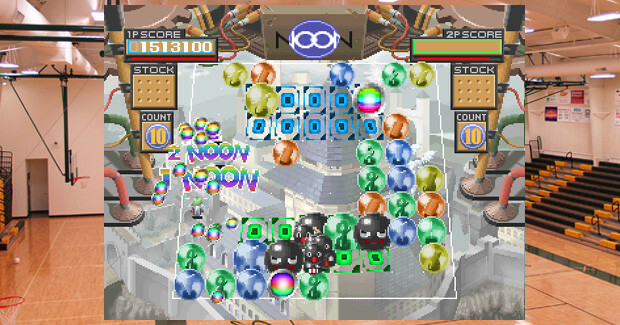 Octomania (aka Noo Kone Puzzle Takoron), despite utilizing a cursor instead of a character, also has some kinship with NOON, insofar as you�re tasked with sorting out a constantly-filling screen, hoping to swamp your rival before succumbing yourself. �.aaaand TIME! *blows whistle* Good work out there today � make sure all balls, blocks, and other various multi-colored implements are back on the rack before you head to the showers. By the way, I don�t want to hear any more reports of towel-snapping �mini-games�, got that? Okay, get yourselves ready for the next class, everyone � I�ll see you all there, same time next week.